I never got around to posting about last weekend's book club. If you've been hanging around here for any amount of time you know that every month I have book club. We alternate between houses-we currently have ten members and each person picks the book when it's going to be at their house. June was my turn (we meet the last Sunday every month but December which we skip) and of course for months ahead of time I was trying to find an acceptable book to pick. Nothing too raunchy, nothing too graphic, nothing too boring haha. 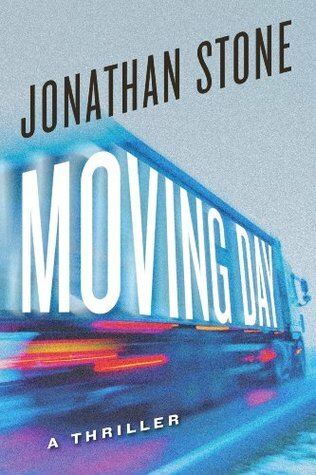 I was just playing around on Amazon looking at books and I came across Moving Day: A Thriller by Jonathan Stone. I downloaded it and a few hours later finally put it down finished. Now if I can read a book without falling asleep or setting it down you know that it's a winner. I always joke that "I"m reading a book" really means "I'm taking a nap". Forty years’ accumulation of art, antiques, and family photographs are more than just objects for Stanley Peke—they are proof of a life fully lived. A life he could have easily lost long ago. When a con man steals his houseful of possessions in a sophisticated moving-day scam, Peke wanders helplessly through his empty New England home, inevitably reminded of another helpless time: decades in Peke’s past, a cold and threadbare Stanislaw Shmuel Pecoskowitz eked out a desperate existence in the war-torn Polish countryside, subsisting on scraps and dodging Nazi soldiers. Now, the seventy-two-year-old Peke—who survived, came to America, and succeeded—must summon his original grit and determination to track down the thieves, retrieve his things, and restore the life he made for himself. Peke and his wife, Rose, trace the path of the thieves’ truck across America, to the wilds of Montana, and to an ultimate, chilling confrontation with not only the thieves but also with Peke’s brutal, unresolved past. I had ran to the store early Sunday morning and got two bunches of flowers. I separated them and put them in mason jars all down the table. I think it looked pretty nice. I had planned to take a bunch of pictures before but well yeah that didn't happen. I did manage to remember when everyone was sitting down though! Left to right: Marion, Nancy, Carol T, Mom, Joanie, Carol K. and Ginny. We were missing two people, Traci and Bridget. I like having it set up in the kitchen vs the living room because no one ever likes to sit on my couch because it's "too squishy" and swallows them up and because this way everyone is closer together and converses more as a group. Plus I get to set the table all fun! Your book club meets look like fun... and the flowers are a lovely touch. I have written that books name down and will get it for my Kindle. I love a good thriller.